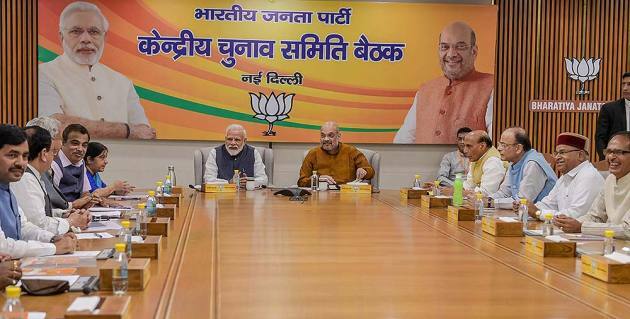 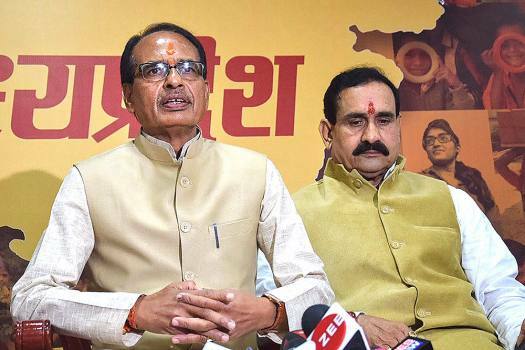 Former chief minister of Madhya Pradesh Shivraj Singh Chauhan addresses a press conference at BJP headquarters, in New Delhi. 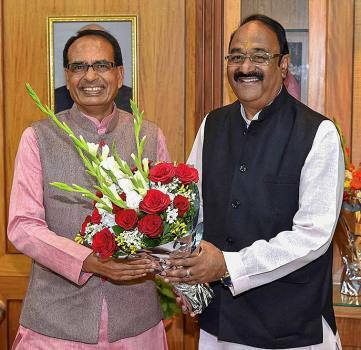 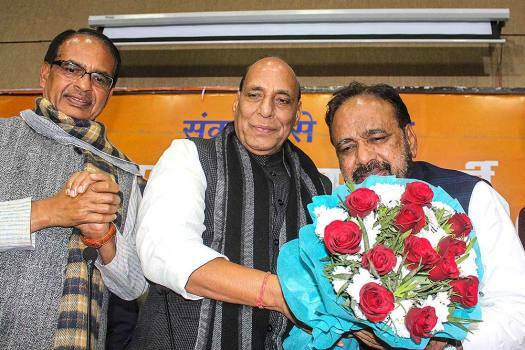 Assembly Speaker NP Prajapati being greeted by former Chief Minister Shivraj Singh Chouhan on the opening day of the Budget Session, in Bhopal. 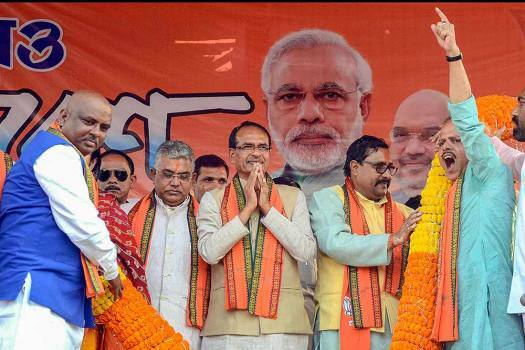 Senior BJP leader Shivraj Singh Chouhan being garlanded during party's rally, at Kharagpur in West Midnapore district of West Bengal. 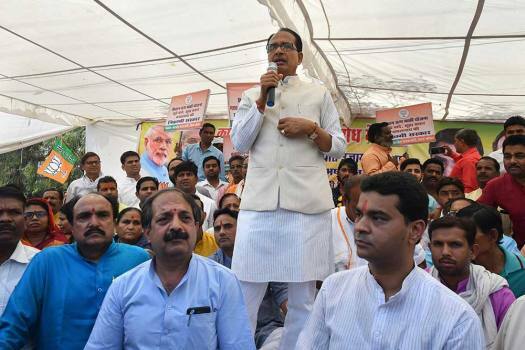 BJP National Vice President Shivraj Singh Chouhan addresses a press conference at the party office in Kolkata. 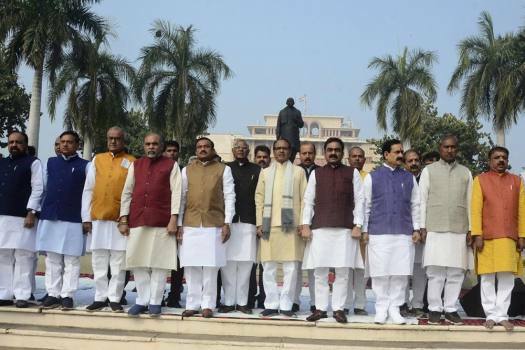 BJP leader and former chief minister of Madhya Pradesh Shivraj Singh Chouhan at Parliament House in New Delhi. 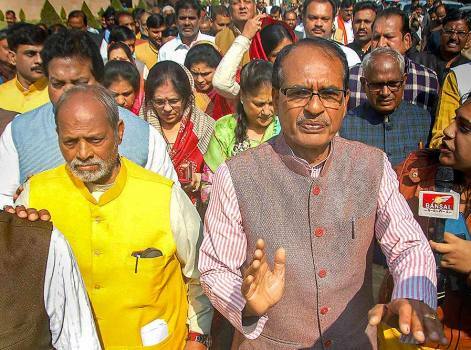 Former Madhya Pradesh chief minister Shivraj Singh Chouhan greets the BJP workers at party's state headquarter, in Bhopal. 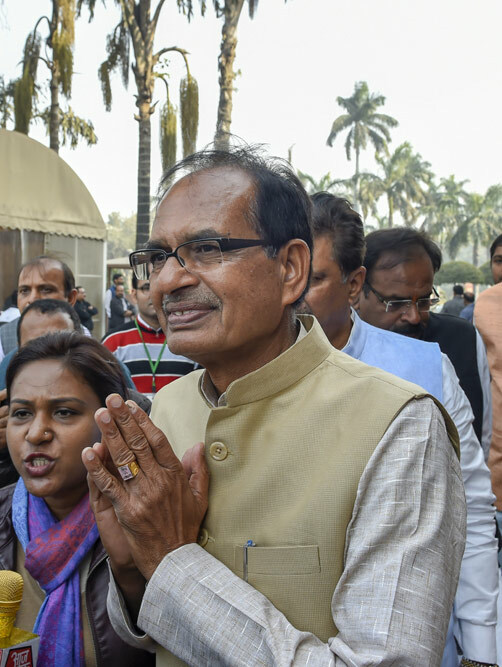 Madhya Pradesh Chief Minister Shivraj Singh Chouhan addresses a press conference at his residence before submitting his resignation to Governor Anandiben Patel, in Bhopal. 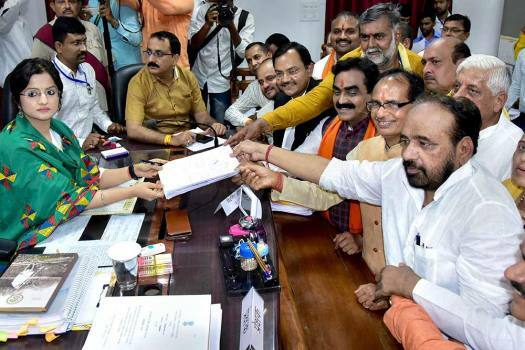 Pooja Shakun Pandey, the national secretary of the right-wing Hindu nationalist group shot at an effigy of the Mahatma, while other members of the group surrounded and applauded her. 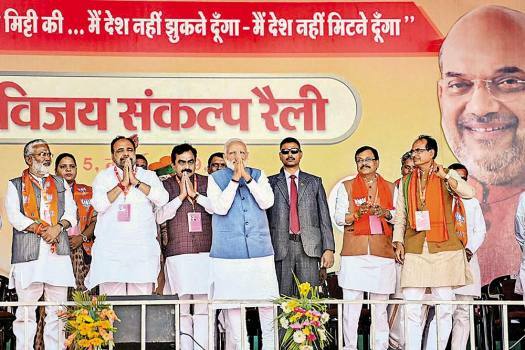 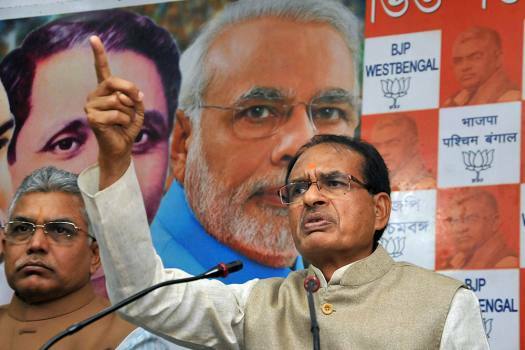 Chouhan, who was recently appointed as the BJP's vice president, said Modi was a popular leader and the party would win the 2019 general elections under his leadership. 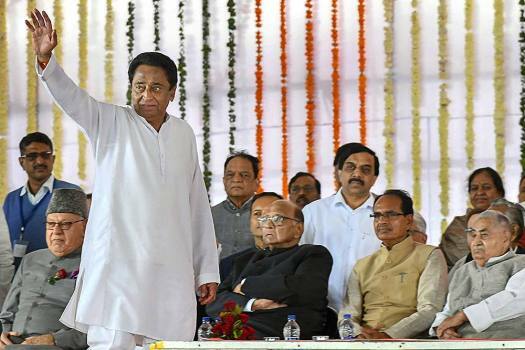 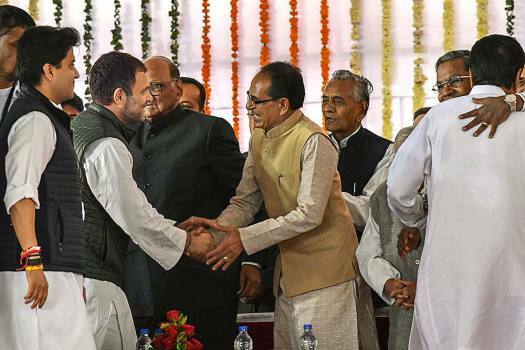 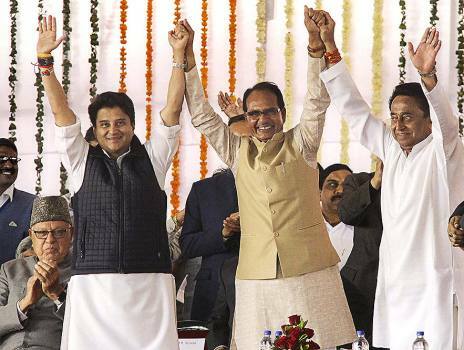 Congress has its path clear in Madhya Pradesh to form a government with Shivraj Singh Chouhan resigning as Chief Minister. 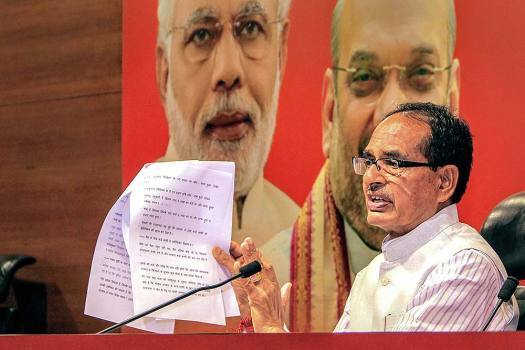 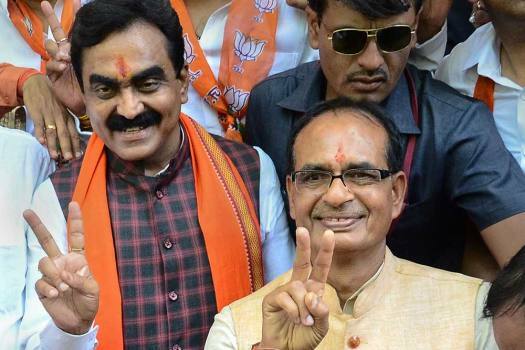 Exit polls suggest there will be a tight race between the BJP and Congress in Madhya Pradesh where Chief Minister Shivraj Singh Chouhan is in power for three consecutive terms. 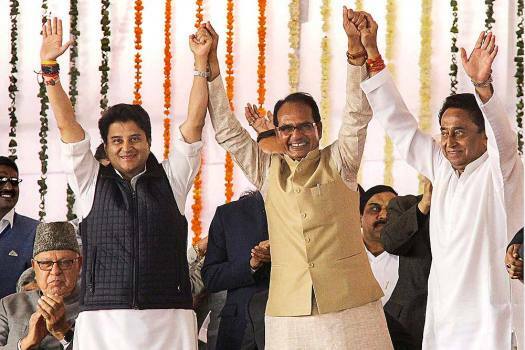 Scindia, who spearheaded an energetic and spirited campaign for the Congress in Madhya Pradesh, said there is an "uprising for change" in the state. 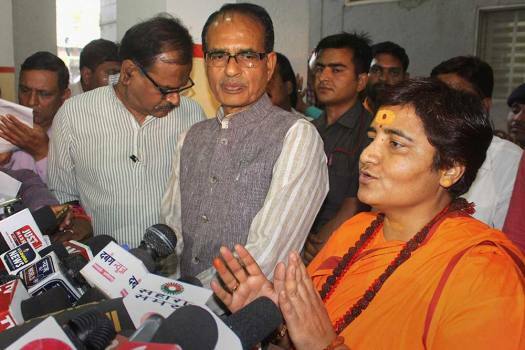 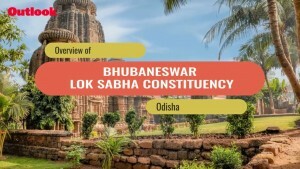 Founder of the temple Devkinandan Thakur said, "After listening to a few devotional songs, the chief minister took the mike from me, and to my astonishment, started singing 'bhajans'."